Find artworks, auction results, sale prices and pictures of Anna Joan Carlisle at auctions worldwide. Charles 2nd Marquess of Rockingham (d.1782) and by descent to hisnephew William, 4th Earl Fitzwilliam (1748-1833) and by descent;Christie's, London, 8 July 1998, lot 92. M. Toynbee and G. Isham, 'Joan Carlile (1606?-1679) - AnIdentification', The Burlington Magazine, XCVI, September 1954, pp.275-7, no. 8, fig. 4. Lady Anne Wentworth (1629-1696) was the eldest daughter ofThomas Wentworth, 1st Earl of Strafford by his second wife, LadyArabella Holles (d.1631). She married Edward Watson, 2nd BaronRockingham in 1654, and through this marriage the Wentworth estatespassed to her son, Hon. Thomas Wentworth, on the death of herbrother William, 2nd Earl of Strafford, in 1695. As a child Lady Anne was painted with her brother, William(1626-1695), and her younger sister, Lady Arabella (1630-1689), ina group portrait by van Dyck commissioned by their devoted father,the 1st Earl of Strafford (for which see O. Millar, in thecatalogue of the exhibition, Van Dyck in England, National PortraitGallery, 1982, no. 32). The physical resemblance between herportrait as a child and the sitter in this portrait isstriking. 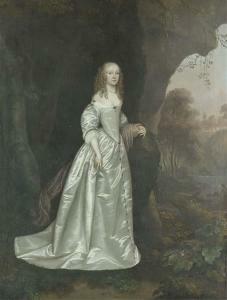 Joan Carlile was among the very first English women to practicepainting professionally. Little is known however of her life or herwork. Her father William Palmer (d.1634) was one of the seniorstaff of St. James's Park and the Spring Garden. Her husband,Lodowick Carlile, whom she married in 1626, was 'Gentleman of thebows' to King Charles I, a minor dramatist, and one of the Keepersof Richmond Park by 1637. They lived at the first Petersham Lodge,just inside the north-west corner of Richmond (New) Park where shepractised as a portrait painter. In 1654 they moved to CoventGarden, then the artists' quarter of London, but returned toPetersham in the summer of 1656. 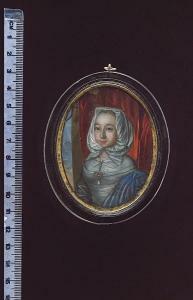 By 1658 she had certainly made aconsiderable reputation as an artist, being included in WilliamSanderson's Graphice, published that year, under the list of'English Modern Masters': 'And in Oyl colours we have a virtuousexample, in that worthy Artist Mrs Carlile'. Although servants ofthe Stuarts they retained their post at Petersham throughout theCommonwealth. In 1660, on the restoration of King Charles II, theywere given the office of 'Keeper of the house or Lodge and the Walkat Petersham'. In 1665 they moved once more to London, living inSt. James's Market. Joan Carlile died there in 1679, four yearsafter her husband. Both were buried in Petersham Churchyard. This picture is stylistically very close to the artist's groupportrait of The Isham and Carlile Families at a Stag Hunt, atLamport Hall (see M. Toynbee and G. Isham, op. cit, p. 276, no.1,fig.7).